“…Tibo’s verses and prose poems (translated by Pajama Press managing editor Erin Woods) playfully consider the experience of poetry—how poems may climb under his quilt at night and keep him awake, or how writing poetry can resemble plucking silence like a flower and gently pressing it ‘into a notebook made of light.’ Unexpected similes and metaphors help the reader see poems in many ways, linking them to nature, feelings and the joy in life. While there is fun in a good—or a whole string of them—the figurative language is more effective than the rhymed verses. Certain concepts—including that poems ‘are infinite inside’—might be difficult for kids to comprehend, but the emphasis on sensations such as flying and floating, feelings of affection and companionship will bring the poems into relief for the young child hearing them. Poetry can be quite intimidating. Not only writing it, but even reading it can be daunting for so many, but perhaps most difficult for children. What is a poem? Does it rhyme or not? Are the verses long or short? There is no simple answer, and this book doesn’t really purport to answer that question. What it does is introduce to children the idea of poetry being everywhere and found in so many gifts of nature—flowers, the sky, birds, the ocean, and more. The entire book is written in a variety of poetic forms, some rhymed, some not, but all quite accessible to children. “This is a picture book about the wonder of poetry. It is also a whimsically illustrated invitation for children to go out and extract poetry from the world around them. 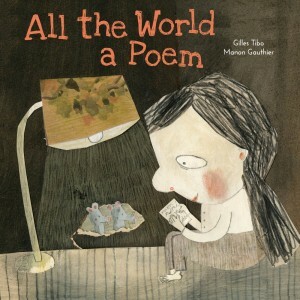 “I am totally in love with All the World a Poem, a celebration of the poetry in the world and the world that’s in poetry, written by Gilles Tibo and illustrated by Manon Gauthier, both award-winners in Quebec and internationally. And now their book has been beautifully translated into English by Erin Woods, whose task fascinates me in what it means to translate a poem, poems being is so intrinsically about their language….